Yay!! It's holiday! Before I go back to my hometown, I've planned to visit karimunjawa.Actually it's been a long time since I really wanna go to Karimunjawa, almost 2 years I think. Karimunjawa can be reached by public boat through Jepara and Semarang. There are 27 islands in Karimunjawa archipelago. Everything can be found here, white sand beaches, corals, colorful fishes, cheap seafood! Next day..we woke up really morning. we afraid the ship would leave us again, but then, they departed at 9 p.m..ckck...it took 6 hours to reach Karimunjawa..and I got seasick haha..Fortunately I could sleep for 4 hours on the ship..AFter we arrived in Karimunjawa, we were fetch to our home stay..without wasting time, we went to shark captivity and we swam with the sharks. Really nervous whether the shark will bite us or not. Then we went back to home stay. Almost forgot! In the night, we ate grilled squid. It was really cheap only Rp 10,000. It is undeniable that Karimunjawa is a paradise! Menjangan Kecil is a wonderful place to hit. Take your goggle and experience the unforgettable underwater. Grab some bread and spread it in the water, colourful fishes will come after you ! That's what I did. 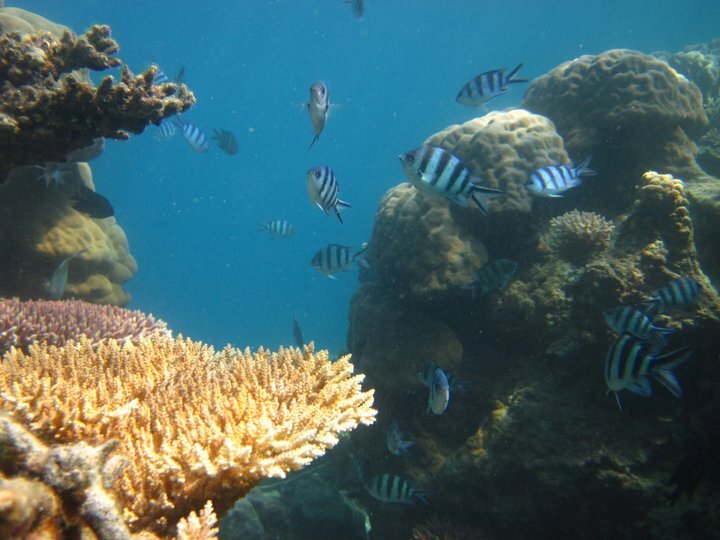 Clear visibility, the corals were just so amazing! Tropical paradise! Dare to climb the tallest coconut tree? I didn't know that climbing coconut tree was not easy. At least I climbed for few meters, sat on the trunk and enjoy the absolute amazing view of the sea. The gradation is just to good to be seen. Light green to dark green, to turquoise, to light blue, to dark blue, perfect combination!